In 1924 the Royal Canadian Corps of Signals established, at Fort Simpson (map), its first Northwest Territories’ radiotelegraph station. This was the third northern station – two were established in the Yukon in 1923 – in the Northwest Territories and Yukon Radio System (NWT&YRS), a system that eventually grew to serve most northern communities. This radiotelegraph system would, for a fee, send a Morse code radio message to Edmonton where it could then be fed into the telegraph system that served all of Canada. Prior to the early 1920s communication between the north and the south was extremely limited with regular mail service for most communities happening perhaps only twice per year, once in the summer by boat and once in the winter by dog team. The Canadian government felt that slow communication was a detriment to the development of the north and the Defence Department was ordered to find a solution, one that didn’t involve stringing up telegraph wire throughout the north. During the First World War there had been a number of significant advances in both high and low frequency radio communication and the Royal Canadian Corps of Signals were able to use these technological advancements to establish the NWT&YRS. The entire system expanded very quickly. In 1925 stations in Fort Smith and Aklavik opened, in 1926 one was set up on Herschel Island and by the end of the 1920s there were stations at Fort Resolution, Fort Norman, Fort Chipewyan, Rae, Cameron Bay and Camsell River. By 1948 there were 23 northern stations in operation. 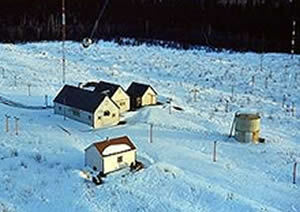 In 1959 these stations within the Northwest Territories and Yukon Radio System began to be transferred to the Federal Government’s Department of Transportation. The last Royal Canadian Corp of Signals staff to leave the north – the operators of the NWT&YRS station at Fort Resolution – departed for the south at the end of March in 1960.